Broiled grapefruit is an unlikely dish at Sunday brunch, but this 3 ingredient recipe is full of bittersweet flavors and done in no time. Choose grapefruit that are firm and brightly colored outside. Juicier ones will feel heavy for their size. Preheat broiler to high heat. Coat a baking sheet with nonstick spray. Place halves on prepared baking sheet. 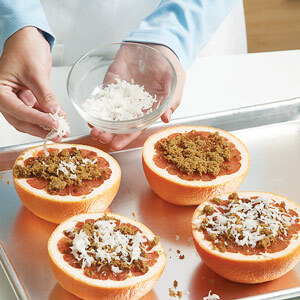 Top each grapefruit half with 1 Tbsp. brown sugar and 1 tsp. coconut. Broil until coconut is toasted, about 3 minutes. Watch carefully to prevent coconut from burning.